This develops when abnormal cells grow uncontrollably in the lungs. These cells do not function like normal cells and thus do not result to healthy lung tissues. These abnormal cells form a tumor as they grow thus interfering with the normal functioning of the lungs. It is important that you report any of these symptoms to a doctor. Some of these may point to other causes. A medical practitioner will be able to check and determine which signs or symptoms are unusual or worrisome. The earliest this is done the better! Gender: Men have higher risk for developing cancer than women; equating them for type, amount and duration of smoking. However because more women are smoking cigarettes for a longer duration than previously, their incidence of lung and upper respiratory tract (mouth, tongue and larynx) cancer is increasing. Lungs cancer is now number one in mortality for women by type of cancer. Age: The occurrence of lung and upper respiratory tract cancers increase with age. Smoking status: Cigarette smokers have up to 20 times or even greater risk than nonsmokers. The rates of ex-smokers who haven't smoked for 10 years, however, approach those of nonsmokers. Type of smoking: Pipe and cigar smokers are at a higher risk than nonsmokers. Cigarette smokers are at a higher risk than nonsmokers or pipe and cigar smokers. All forms of tobacco including chewing obviously increase the user’s risk of developing cancer of the mouth. Number of cigarettes per day: Male smokers of less than one-half pack every day have 5 times vulnerable than non smokers. Male smokers of one to two packs per day have 15 times more vulnerable than nonsmokers. Smokers of more than two packs per day are 20 times more likely to develop cancer than non smokers. Type of cigarette smoked: Smokers of nicotine/low-tar cigarettes have slightly lower chances of developing cancer of the lungs. Duration of smoking: The frequency of lung and upper respiratory tract cancer increases with the period of time people have smoked. 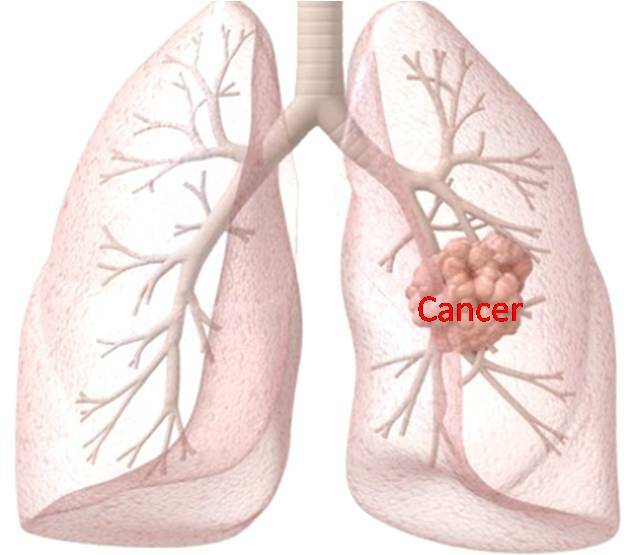 Type of industrial work: Exposure to some materials used in the industries has been associated with lungs cancer. Smokers who work in these industries have greatly increased risks. Exposure to arsenic, radon, radiation from occupational/medical/environmental sources, and air pollution increase the risk of lungs cancer. 24 yrs or below (low-risk category) - These individuals have a low risk of developing cancer . 25 to 49 yrs (light risk) - Okay as a smoker but you can easily quit the habit. 50 to 74 yrs (moderate risk) - as a moderate smoker, your risk of lung and upper respiratory tract cancers are increased. If you stop smoking now, this risk will decrease. 75 or over (high risk) - If you are a heavy smoker, the chances of developing lung cancer are highly increased. Your best option at this stage is to stop smoking. See a doctor if you have a hoarse voice, persistent cough, nagging pain or a sore in the mouth or throat.